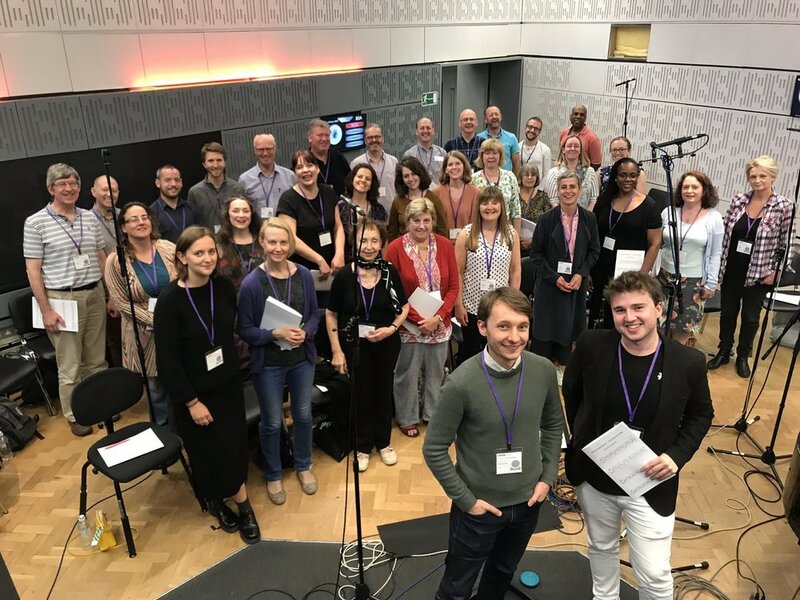 The NHS Symphony, commissioned by BBC Radio Documentaries for BBC Radio 3, has this week received awards at the Prix Europa and at the Audio and Radio Industry Awards (ARIAS). At the Prix Europa, held in Berlin, it received Special Commendation for Best European Radio Documentary, in a field of 29 entries from 20 countries. At the ARIAS, held in Leeds, it received the Silver Award for Best Factual Storytelling. Alex worked with producer Laurence Grissell to create The NHS Symphony, a portrait of the NHS at 70 in sound and music. Alex’s music was recorded at BBC New Broadcasting House by singers from the Bach Choir, NHS Lewisham & Greenwich Choir and Barts Choir. DIRECT MESSAGE is now out today on Orchid Classics! NHS Symphony nominated for an ARIAS Award! I’m thrilled that The NHS Symphony has been nominated in the ‘Best Factual Storytelling’ category at the 2018 Radio Academy ARIAS Awards! This was a really wonderful project to be involved with, bringing together the combined forces of The Bach Choir, The NHS Choir, Barts Choir and more to honour the NHS at 70. In the work, commissioned by BBC Radio Documentaries, my music forms part of a sonic portrait of the NHS, all recorded in binaural audio for BBC Radio 3’s ‘Between the Ears’. On Saturday 30 June, BBC Radio 3 broadcast the NHS Symphony which I've co-created with producer Laurence Grissell over the past few months. It's a portrait of the NHS at 70 in music and sound, and as part of this aural tapestry I've written choral music to be performed by 3 NHS choirs, as well as The Bach Choir. Requiem: Tickets Now On Sale! Tickets are now on sale for the premiere performance of my Requiem, with soloists Laura van der Heijden and Nicky Spence. The concert is in aid of Children & the Arts, and takes place on Saturday 9th June at Holy Trinity, Sloane Square. Do come along! I'm excited to be curating a concert taking place in June this year, to include the first performance of my Requiem – marking 100 years since the end of the First World War. The Requiem will set a combination of the traditional Latin text and new poetry by Gillian Clarke, National Poet of Wales and recipient of The Queen's Medal for Poetry. It will feature 2 phenomenal soloists: cellist Laura van der Heijden and tenor Nicky Spence. The concert will also include amazing choral music by MacMillan, Tavener, Parry and Purcell, and the whole event is in support of The Prince's Foundation for Children and the Arts. I'm very excited to be heading to New York for the premiere of Come and See at the Cathedral of St John the Divine! Come and See is a big anthem for 2 choirs and organ, commissioned by the Metropolitan New York Synod, Evangelical Lutheran Church of America to mark the 500th anniversary of the 1517 Reformation. The anthem is a setting of wonderful, evocative text by Andrew Nurkin, a newly-commissioned poem which reflects on Psalm 46; this psalm was the source of Martin Luther's 'Ein feste Burg ist unser Gott', which of course is the basis for Bach's Cantata 80 (and countless more music – the finale of Mendelssohn's 5th, for instance...). Just as Luther's text paraphrases this psalm for the purposes of the newly reformed church, Nurkin's text considers the significance of its words 500 years on and their resonance in the contemporary world. It's an incredibly powerful text, and has been a privilege to set. I've tried to capture the scope and scale not only of the text but also of the setting and occasion: St John the Divine is the largest Anglican cathedral in the world (and the 4th-largest church of any kind), and I've had more than 100 singers, a legendary Great Organ, and a cavernous acoustic to play with... To be able to paint on such a vast canvas is inordinately thrilling, and I've been keen to take full advantage of these massive forces, mindful too of the huge significance of this moment in time for so many people. I'm beyond grateful for the tremendous amount of work that has already gone into preparing this piece, and it's a dream to be able to come and experience the whole event in person! The Festive Eucharist commences at 5.30pm EST (9.30pm GMT) on November 1st and will be broadcast live on Facebook – I'll be sure to post a link to this nearer the time! For some reason, this really struck a chord with me. I think that the phrases/quips/comments which speak to us the most are those that grapple with something huge, but do so with a wonderful sense of clarity; in this case, the scope couldn't be larger, but the meaning couldn't be simpler. The remark doesn't presuppose or depend upon religious conviction one way or the other, nor does it mystify art or love. These are, simply, three ways in which we all, to varying extents, aspire towards something beyond our day-to-day experience. Far from placing art on its usual mysterious pedestal, Sørensen articulates a very human truth. I've been immersed in sacred music a fair amount recently, so I suppose I’ve been viewing his statement through something of a stained-glass prism. Some of my favourite musical experiences of the last few years have involved singing at or writing for choral evensong services; Sørensen's words perhaps help to explain why this mixture of musical and Christian traditions means so much to such a range of people, regardless of their prior experience of (or attitude towards) either. Music within a religious service exists in quite an intangible space: it seems to resemble a performance, and yet that word doesn’t quite fit. There’s no applause, singers and ‘audience’ are united as members of a congregation, and any music must take account of both the liturgical calendar and the suitability of text. Music is thereby liberated from any inflated sense of its own importance – in a service, it primarily exists to, well, serve. This has been an unexpected joy of my first few forays into writing sacred music: the music, like the act of worship it’s part of, must reach beyond itself and aspire upwards in some way. This may or may not be devised in an explicitly religious way – some of my very favourite religious music is written by composers with complicated or nonexistent relationships with God. Rather, the very attempt to reach beyond oneself has meaningful consequences – the extent to which those are perceived as artistic, religious or both is up to each individual. In the Nunc, the setting of the word 'Father' becomes the main accompanimental figure (see below) – it never appears in the choir (apart from at the equivalent moment in the gloria), but it’s nonetheless present throughout on the organ. It's even heard first on precisely the same pitches, though tonally recontextualised from B-flat to F. The imagery I hoped to aim at here is that God, so eagerly praised throughout the Mag, is now close-by, listening to the prayer offered in the Nunc. In the biblical account, Simeon utters these words with the baby Jesus literally in his arms, so it seemed an appropriate idea to try and represent. Now, music is so wonderfully abstract that this won’t (or can’t?) be immediately obvious when listening – but maybe that’s the point. Music, like faith, allows us to engage with the intangible, the indistinct, the stuff that doesn’t immediately swim to the surface. And this is surely a big part of what makes music and religion such a winning combination. Sørensen’s idea that art, religion and love are all 'part of the same dream' is afforded special potency in an arena that celebrates all three. It helps to explain why this environment has so quickly become meaningful for me as a composer, and why I’m so keen to keep exploring its seemingly inexhaustible riches. I'm thrilled to be participating in the London Symphony Orchestra Panufnik Scheme 2017/18. 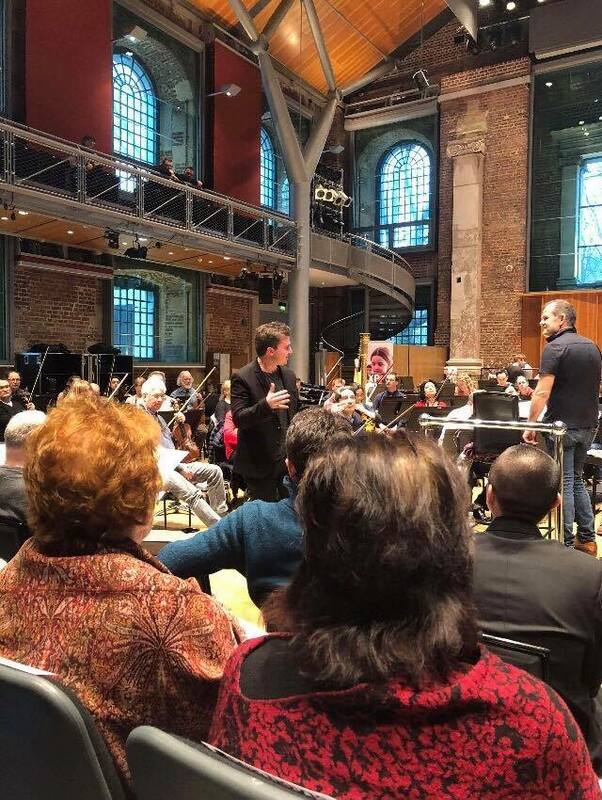 I've seen the LSO perform more than any other orchestra; they're responsible for many of my most meaningful and memorable concert experiences. It's an absolute dream to have the opportunity to write for them, and I'm so excited to get started in March. There's more info about the scheme here. I've grown up worshipping the twin gods of classical music and musical theatre. Both fascinate and obsess me, constantly jostling for position in my head. Slapping a big Sondheim dissertation in the middle of my otherwise classical-based Cambridge finals was one way of writing myself out of this cerebral juggling act. Occasionally, though, someone's music grabs hold of me and won't let go, eclipsing all else; most recently, that someone was Lin-Manuel Miranda, and that music was Hamilton. Hamilton surely needs little introduction – a revolutionary (pun intended) account of the founding of the USA, it is simply a phenomenon. Its cultural reach already surpasses that of (perhaps) any Broadway show in history, and it has garnered unprecedented critical acclaim (the Pulitzer Prize for Drama, a record-breaking 16 Tony nominations, a Grammy, etc. etc.) to boot. Its impact is so overwhelming, and the dramatic plaudits so great, that it's actually easy to overlook just how ingenious the music itself is. I'd like to take a moment to strip back everything else and look solely at this music, the way we get to do when delving into a classical piece. Miranda, together with his orchestrater/MD Alex Lacamoire, has created an incredibly rich score, and I'm keen to peek under the hood. Unity is something that's particularly prized in classical works. Though the surface of the music may be varied and unpredictable, the musical glue that binds everything together is crucial to how great pieces operate. This might be easily perceptible (recurring themes/motifs), or it might be buried deep down (a harmonic scheme or formal plan). A good example of such glue is the opening of Beethoven's 5th Symphony – maybe the 8 most famous notes ever. Those notes are truly the seed from which the symphony grows, and they're peppered all over the score in all manner of ways. Rather like the prologue to Romeo and Juliet, this opening doesn't merely set the scene for the rest of the work, it provides something of a summary of its content. In Act II, Hamilton's wife, Eliza, sings 'Burn', in which she charts the rise and fall of their relationship. This song is reached by means of metric modulation: its opening ostinato figure appears in the previous number ('The Reynolds Pamphlet'), where in the environment of a different tempo it is heard as triplet crotchets – at the new tempo, the same pattern, moving at the same speed, is heard as quavers. In 'The Reynolds Pamphlet' Hamilton publishes details of his extramarital affair in order to clear his name from other charges; in 'Burn' we see Eliza's response. Hamilton and Eliza are at their most distant at this moment in the show, and yet are still bound by marriage: it is apt, then, that these adjacent songs' tempi are distinct yet related through this ostinato pattern. Additionally, the initial chord sequence of 'Burn' is almost precisely that of the show's opening number, 'Alexander Hamilton'. Eliza's version is cast in a 6/8 metre, a stark contrast with the assured 4/4 of Hamilton's life story: as Eliza's world crumbles around her, Hamilton's once-unstoppable ambition is a distant memory. The chorus of this song is the single word 'burn', luxuriously, melismatically set to another 'borrowed' chord sequence. Here the effect is devastating: this sequence comes from 'That Would Be Enough', specifically Eliza's lines (to Hamilton) 'Look at where you are / Look at where you started'. In 'Burn' she's effectively posing the same question again, but this time heartbroken and angry; the returning chords, obscured though they are by the changed metre and melody, really make her point hit home. Like all great music, Hamilton is not only aware of the tradition it finds itself in, but brings a fresh perspective to it. Of course, the lyrics achieve much of this. Miranda makes (in my opinion) a huge improvement on a famous line from Gilbert and Sullivan's The Pirates of Penzance, when George Washington raps 'Now I'm the model of a modern major general / The venerated Virginian veteran whose men are all / Lining up, to put me up on a pedestal'. When Aaron Burr tells Hamilton 'I'm with you, but the situation is fraught / You've got to be carefully taught', Miranda is referencing South Pacific's song of the same name. In South Pacific, it speaks to the fact that racism isn't a matter of instinct, but rather learned through considerable social indoctrination. For Burr, this is how politics works: despite purporting to share Hamilton's revolutionary zeal, Burr is unwilling to take a firm stance on any issue, preferring to 'talk less, smile more'. More immediately, the number in which Hamilton conducts his extramarital affair ('Say No To This') ends with the line 'Nobody needs to know'; this also happens to be the title of the male infidelity song in Jason Robert Brown's The Last Five Years. The music is no less active in its embrace and use of tradition. One of the main reasons Hamilton is so effective is because the language of hip-hop is never used gratuitously; rather, Miranda explores a striking parallel between the hot-tempered, word-spinning Founding Fathers and the rap / hip-hop artists he grew up with, and uses this as the language of revolution. King George III's pleas for the colonists to be content with / return to British rule are playfully cast as break-up songs, most closely resembling Britpop (of course). A particularly pleasing stylistic touch is the use of jazz for Thomas Jefferson, who appears for the first time at the start of Act II. He's been in France for vast swathes of Act I's revolution, and urgently needs to catch up on events (his song is called 'What'd I Miss'). Similarly, jazz is used as an outmoded style to contrast with the others' hip-hop – no rapping here. The chorus takes place over the archetypal 12-bar blues progression and walking bass – in full boogie-woogie mode, Jefferson could not be any more obviously an outsider in the post-revolutionary environment. Of course, he learns quickly and takes on Hamilton at two Cabinet meeting rap battles officiated by Washington... The musical hook in these confrontations is directly derived from on the show's count-to-nine motif, used elsewhere during real duels; this highlights the magnitude and even danger of these battles of ideas. Jefferson's jazz has lasting effects, though... In 'The Room Where It Happens', Aaron Burr's style becomes palpably corrupted by Jefferson, prefiguring his defection to Jefferson's Democratic Republican party soon after. This song is unlike anything Burr has sung before, strikingly fusing his hip-hop aesthetic with New Orleans-style, Dixieland jazz. Again, musical traditions are utilised to powerful dramatic ends. There are a million ways to obsess over Hamilton, to peel away at its layers of meaning and marvel at its subtlety. Lin-Manuel Miranda has given us a true gift of a work of art, a show that will be 'constantly confusin', confoundin'' us (to paraphrase Burr) for years to come, yet one that is also powerfully immediate in its impact. Engaging with Hamilton's music is just one way to get deeper into it, but (I think) a fun and fruitful one! Now, what'd I miss? Today, the Three Tempestuous Tunes I wrote back in 2012 are happening in the US for the second time. I'm delighted that these songs have had such a happy and varied life so far; after appearing on Nicky Spence and Malcolm Martineau's album As You Like It, they've had outings in Statford-upon-Avon for the Shakespeare 400 celebrations (which I wrote a little about here) and in California. This time around, the venue is Manhattan, Kansas, and I'm thrilled that Chris Thompson is performing them. The songs are settings of passages from acts 2 and 3 of The Tempest. Amidst the madness of the past few days, it's more than a little comforting to know that the ubiquity of such things as music-making and Shakespeare doggedly refuses to be, ehem, trumped. The strange and beautiful timing of this performance – taking place in a ruby-red Republican stronghold, no less – did, however, get me thinking a bit about those Shakespearean nuggets of wisdom which seem to cut across time. If nothing else, it's been a cathartic distraction from the relentless noise. Caught between a shock and a Bard place, I've tried to focus on the latter. There are certainly strands in The Tempest itself which stand out as relevant – in fact, the final passage that I set for these songs seems spookily apt. It's Caliban's moment of giddy, drunken self-assertion, wherein he declares his hard labour to be over ('No more dams I'll make for fish...'). He exclaims, 'Caliban has a new master. Get a new man. Freedom, hey-day! Hey-day, freedom! Freedom, hey-day, freedom!' Even as Caliban ecstatically hails his new-found liberation from servitude (to Prospero), he willingly casts himself as subject to a new power (Stephano). Later he offers to lick his new master's shoe. It's not hard to relate Caliban's apparent cognitive dissonance to the conditions which created President Trump: Caliban is so resentful of Prospero's authority that he is happy to obey a new master in order to achieve 'freedom'; Trump's core supporters have similar zeal to escape the status quo, to such an extent that they will overlook demagoguery in pursuit of change. Beyond The Tempest, Shakespeare plays prophet with even more panache. In Richard III we observe the rise of a ruler categorically unfit to rule, a sociopath whose goal of attaining power at first seems impossibly remote. Richard compensates for his many insecurities through an unrelentingly 'braggadocious' disposition (to quote someone notoriously in possession of 'the best words'), his behaviour of course replete with rampant misogyny and bullying. Richard III shows power being attained not by violent means (as in Macbeth) but through deceit, the disparagement of opponents, and the exploitation of fears relating to national security. Even more striking is the unwitting complicity of those around Richard in his rise to the throne. The surrounding characters, representing the country more widely, are well aware of Richard's villainy, but they find the notion of his ambitions being realised so inconceivable that they are unable to recognise it until events are too far in motion to be reversed. And the relentless onslaught of his horrific behaviour results in a population desensitised to ghastliness, their voices smothered by a combination of fear and fatigue. At the moment of Richard's election, the people are silent, 'like dumb statues or breathing stones'. This silence is enough to crown a monster. Trump may want to build a wall but Shakespeare saw the writing on it over 400 years ago. One can't help thinking that as millions awoke on Wednesday they 'cried to dream again', like Caliban at his most candid and poetic. But we might also draw hope from this: Shakespeare gives Caliban that most beautiful speech ('Be not afeared; the isle is full of noises...') at the very moment that the creature seems most debased, most ludicrous. It might just be a powerful reminder that at the most absurd of times, revealing insight and recourse to the beautiful may in fact be closer than ever. I've made 3 Christmas arrangements for the fantastic St John's Voices! I spent an incredibly happy 3 years singing with SJV (the mixed-voice choir of St John's College, Cambridge), and I'm really excited that we'll be heading to Hong Kong and Singapore this December. This will be SJV's first tour to Asia, and it'll be centred around performances of Handel's Messiah. We'll perform my arrangements first at SJV's Christmas Carol Service at 6pm on 28th November (Christmas comes early in Cambridge), in St John's Chapel – do come! I'm also thrilled that we'll be taking my Nunc Dimittis (part of St John's Service, which I wrote for SJV earlier this year) to Asia, performing it in Hong Kong City Hall on December 17th (details of that concert can be found by clicking here). I remain enormously grateful to Graham Walker, director of SJV, whose encouragement and championing of new repertoire in general has meant a huge amount to me. You can listen to a complete recording of my St John's Service below, and watch this space for potential snippets of these Christmas arrangements in the coming months! It was brilliant to be back at the Orpheus and Bacchus Music Festival in Bordeaux this year. I'm delighted that Leo Popplewell and William Clark-Maxwell premiered the cello duet I wrote for them, Cain and Abel. Nicky Spence and a whole host of fantastic opera singers are cycling from Glasgow to London – a ‘Song Cycle’, geddit? – to raise money for the brilliant Help Musicians UK. I was delighted to write them a jingle to help them along the way! They recorded it for Classic FM; the video of this can be viewed below. I’m thrilled that, as they end their epic journey by riding into the Coliseum, my little offering will get its live premiere on stage at English National Opera. I'm absolutely thrilled that my Three Tempestuous Tunes were broadcast on BBC Radio 3 on the 400th anniversary of Shakespeare's death, live from Stratford-upon-Avon. They were programmed as part of a special episode of Saturday Classics, curated by Richard Sisson (formerly one half of Kit and the Widow); Richard was joined by baritone Mark Stone for the broadcast premiere of these songs. I'm delighted that several different singers have now performed these songs; I'm especially looking forward to their second U.S. performance this November. A few days ago I spoke to Cambridge TV about my new piece ‘Exodus’ for Holocaust Memorial Day, which was today. I was privileged to set a poem by Holocaust survivor Lotte Kramer for children’s choir. It was wonderful to meet her after the performance, which took place at the Cambridge Corn Exchange today. I’m really excited to be bringing my Serenade for Tenor, Horn and Strings to Cambridge, its first performance since the premiere at Snape Maltings Concert Hall during Britten’s centenary weekend in 2013. It’s happening at St John’s Chapel at 8pm on Saturday 13th February, completely free and open to all! More information can be found on Facebook, here. I’m particularly thrilled that King’s College Choir tenor Toby Ward and Royal Academy of Music horn player Alexei Watkins (to whom the Serenade is dedicated) will be soloists for this performance. Joining them will be a bespoke ensemble led by Gabriella Jones, featuring some of the best string players from Cambridge University, Aldeburgh Young Musicians, and Hills Road Sixth Form College. My Serenade, of course, takes the ensemble Britten made famous as its starting point, and was developed and realised first at Aldeburgh, the artistic environment he created. Each of the four poems I set reflect key aspects of Britten’s character; the Serenade is therefore in many ways an ode to Britten. It seems appropriate, therefore, to precede it with his arrangement of Purcell’s Chacony in G minor. The performance as a whole will thus be rich with Britten’s musical footprint, pointing both forwards and back.